"A Crime In France By France"
French President Francois Hollande acknowledged French complicity in roundup of Jews, promises to secure French Jews. Today marked the 70th anniversary of the infamous, hardly known Roundup of 11,000 Jews from the Paris area and their incarceration under inhumane conditions in the Winter Stadium of Paris --the first step toward sending them towards Auschwitz and their deaths. 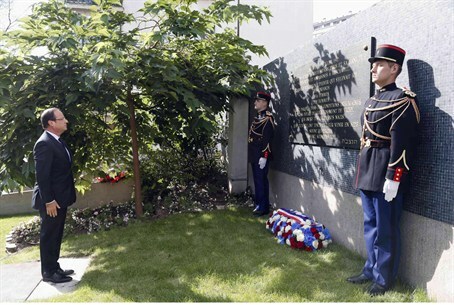 Francois Hollande, the President of France, together with members of his cabinet, commemorated the event and took responsibility in the name of France, saying ""the truth is hard and cruel… No single German soldier was mobilized" because "this crime was committed in France and by France." For a long time after the Second World War, France persisted in spreading the myth that the extensive collaboration with the Nazi regime was limited to a handful of Frenchmen. Former French President Jacques Chirac was the first to admit more widespread French complicity in 1995. Holland lamented the fact that French youth did not know about this black day and promised that there would be no "lost memory". Hollande and his Minister of interior Manuel Valls promised to do their utmost to protect Jews in France today. "The security of the Jews of France is not a matter of Jews, it is that of all Frenchmen." Serge Klarsfeld, president of the Association of Daughters and Sons of Jews Deported from France, who led the fight to expose collaborators who were still prominent in French society, noted that France had saved 60,000 Jewish children as opposed to the 11,000 who were sent to their deaths. The book Sarah's Key, however, by Tatiana de Rosnay, which was made into a successful movie , tells the story of Parisian Jewish children who were not so lucky. Heart surgeon Dr. Riohard Prasquier, head of the Representative Council of Jewish institutions of France, told Hollande that "The Jewish community has confidence in you and has confidence in the Republic." He, however, noted a reality where ant- Semitism "is expressed in our country with incredible violence and there is also a daily reality which does not deserve any weakness." It should be recalled that most Jews voted in the French presidential election for Hollande's opponent Nicolas Sarkozy, because they were not certain whether they could count on the French socialists in the fight against anti-Semitism. They had been disappointed by the firmness of the previous Socialist government of Prime Minister Lionel Jospin (1997-2002). French schools with significant Muslim populations have encountered resistance in teaching me Holocaust and sometimes the schools have taken the easy way out. When Israel Radio reported this story, its correspondent in France, Gideon Kouts, reported that Hollande came over and acknowledged the threat to Israel and French determination to combat the threat. This was not mentioned in the ceremony nor in any of the French papers that covered it.